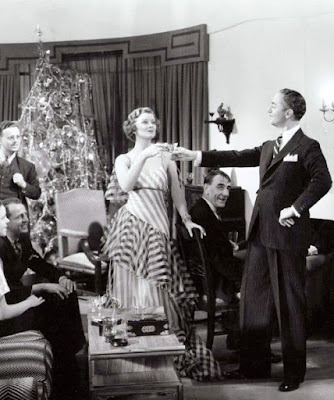 This week TCM is airing all six of The Thin Man movies starring Myrna Loy and William Powell. This week, TCM is airing great movies from stars like Irene Dunne, Ruth Roman, and Myrna Loy. Plus, they are celebrating Christmas with dozens of holiday classics. So, without further ado, let's jump right in to this week's offerings. Just a note: All times are Eastern Standard Time and the highlighted texts have links to full length articles. Birthday tributes: Irene Dunne on Tuesday; Ruth Roman on Thursday. 1. A lineup of Christmas movies on Thursday prime time starting with Holiday Affair (1949) at 8 p.m.
3. 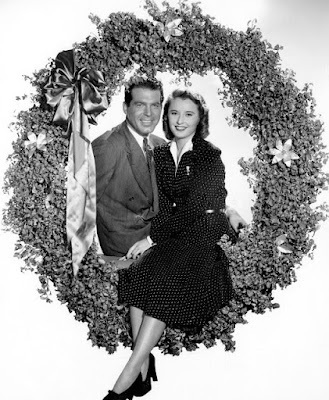 24 hours of Christmas movies on Saturday starting with Tenth Avenue Angel (1948) at 6:45 a.m..
4. A lineup of religious movies on Sunday daytime starting with Going My Way (1944) at 6 a.m.
Sunday Prime Time: A night of feel-good movies from old Hollywood auteurs Frank Capra and Preston Sturges. Silent Sunday Nights: not airing. Best Day to DVR: Friday prime time and late night. TCM is airing The Thin Man movies starring Myrna Loy and William Powell as sophisticated private detectives Nick and Nora Charles. James Cagney and Ruby Keeler salute the Navy in Footlight Parade (1933). Three daytime picks: The theme is a movies about murder at home starting with Jean Simmons as a beauty who cuts brake lines for some fast cash in Angel Face (1953) at 6 a.m followed by Bette Davis putting some holes in her married lover in The Letter (1940) at 12:45 p.m. Finally, ex-con Robert Mitchum stalks lawyer Gregory Peck and his family in Cape Fear (1962) at 6 p.m.
Prime time lineup: TCM's guest programmer for December is director Amy Heckerling. She is a huge fan of James Cagney and she chose two of his films for her prime time selections. First up is the gangster saga, The Roaring Twenties (1939) at 8 p.m. followed by the musical Footlight Parade (1933) at 10 p.m.
Late night pick: Heckerling considers 8 1\2 (1963) at midnight "the most brilliant film ever made about creativity." 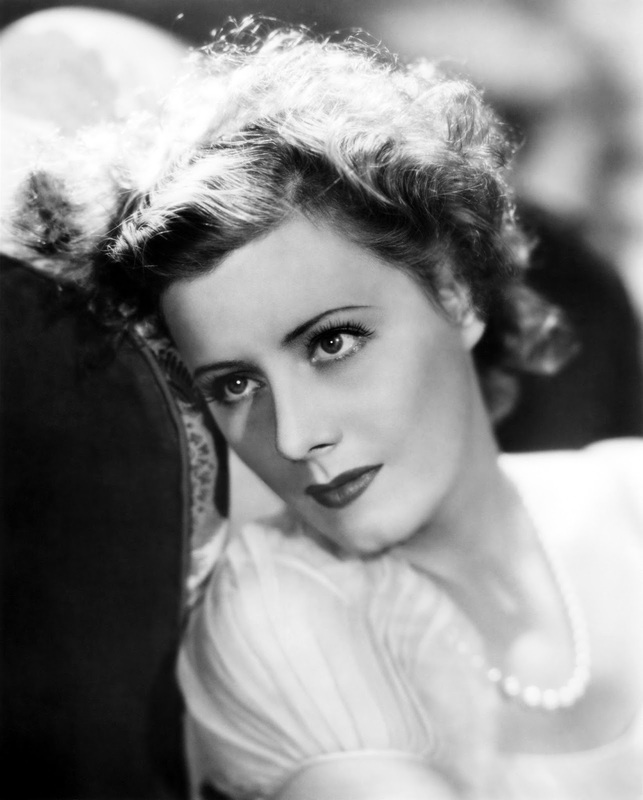 Three daytime picks: A birthday tribute to Irene Dunne who was born Irene Marie Dunn Dec. 20, 1898, in Louisville, Ky. Her lovely singing voice led to a career in musical theater. She originated the role of Magnolia Hawks in Show Boat -- she played the same role in the 1936 film, which is airing at 6 p.m. She later became one of the top stars of the 1930s in movies like Cimarron (1930) at 7:15 a.m. and Love Affair (1939) at 2 p.m.
Prime time lineup: TCM is featuring films about elderly people each Tuesday in December. This week's lineup features movies about swan songs starting with Randolph Scott and Joel McCrea as two aging cowboys who have one last adventure in Ride the High Country (1962) at 8 p.m. and Spencer Tracy trying to land a legendary fish in The Old Man and the Sea (1958) at 9:45 p.m.
Late night pick: The Sunshine Boys (1975) at 2 a.m. features George Burns and Walter Matthau as two comedians get together for a TV comeback. 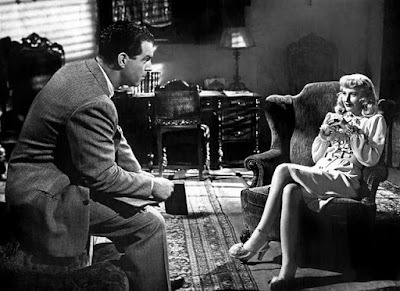 Three daytime picks: The lineup includes some of the best films noir ever made including Out of the Past (1947) at 6 a.m., Double Indemnity (1944) at 2 p.m. and Mildred Pierce (1945) at 6 p.m.
Prime time lineup: Film critic and historian Leonard Maltin unearths more treasures from the Disney vault. Wednesday's selections feature animal adventures starting with Perri (1957) at 8 p.m. which uses documentary footage to tell the story of a squirrel living in a forest. Grab your hankies for the all-time tearjerker Old Yeller (1958) at 9:30 p.m. about the beloved pet of a pioneer family. Late Night Pick: Dean Jones and Suzanne Pleshette get a lot more than they bargained for when they adopt a puppy in The Ugly Dachshund (1966) at 1:15 a.m.
Fred MacMurray and Barbara Stanwyck in Remember the Night (1940). Three daytime picks: A birthday tribute to Ruth Roman who was born Dec. 22, 1922, in Lynn, Mass. Her most famous film role was as Farley Granger's loyal girlfriend in director Alfred Hitchcock's Strangers on a Train (1951) at 6 p.m. but she often appeared in Westerns like Lightning Strikes Twice (1951) at 10 a.m. in which she plays an actress who gets mixed up in a murder case on a Texas dude ranch and Dallas (1950) at 3 p.m. where she plays a Mexican woman whose family is being victimized by outlaws. Primetime lineup: The prime time theme is two Yuletide romances starting with Robert Mitchum courting war widow Janet Leigh in Holiday Affair (1949) at 8 p.m. followed by D.A. Fred MacMurray falling for shoplifter Barbara Stanwyck in Remember the Night (1940) at 9:45 p.m.
Late Night Pick: Stan Laurel and Oliver Hardy's version of Victor Herbert's holiday operetta Babes in Toyland (1934) at 1:15 a.m. is a delightful holiday treat. 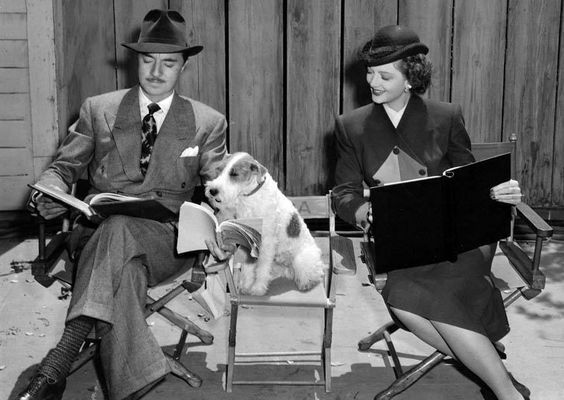 William Powell, Asta, and Myrna Loy study their The Thin Man scripts. Three daytime picks: TCM is devoting all of Friday to star of the month Myrna Loy. This week features many of her films with frequent co-star William Powell starting with the pre-code gangster drama Manhattan Melodrama (1934) at 7:30 a.m. followed by the screwball Libeled Lady (1936) at 12:15 p.m. and the comedy of remarriage Love Crazy (1941) at 6 p.m.
Prime time lineup: TCM is showing all six of Loy and Powell's movies as sophisticated private eyes Nick and Nora Charles starting with The Thin Man (1934) at 8 p.m. and After the Thin Man (1936) at 9:45 p.m.
Late night pick: Fire up the DVR for Another Thin Man (1939) at 11:45 p.m.; Shadow of the Thin Man (1941) at 1:45 a.m.; The Thin Man Goes Home (1945) at 3:30 a.m., and Song of the Thin Man (1947) at 5:15 a.m.
Christmas Eve will bring 24 hours of holiday movies to TCM. The prime time lineup is all about host Robert Osborne's favorite Yuletide films starting with Barbara Stanwyck as a homemaking columnist who is forced to spend the holidays with her demanding publisher (Sydney Greenstreet) in Christmas in Connecticut (1945) at 8 p.m. followed by the musicals The Dolly Sisters (1945) at 10 p.m. and In the Good Old Summertime (1949) at midnight. The Christmas Day lineup will feature religious movies starting with Going My Way (1944) at 6 a.m. and ending with King of Kings (1961) at 5 p.m. The evening lineup will feature classics from directors Frank Capra and Preston Sturges starting with Gary Cooper moving from small-town eccentric to millionaire in Mr. Deeds Goes to Town (1936) at 8 p.m. and Joel McCrea moving from Hollywood film director to bum in Sullivan's Travels (1942) at 10 p.m.